A variety of non profit organizations met at NJSFWC Headquarters to discuss ways to combat hunger in New Jersey. THe NJSFWC proposed Operation: Peanut Butter, Jelly & Beans to the group of approximately 20 attendees. A food drive was proposed for April thru June and is open to the public and any organization or business that would like to participate. Contact Marjorie at (973) 943-2155 to find out how more information and how you can help! The New Jersey Women of Achievement Awards were initiated in 1981 and are co-sponsored by New Jersey State Federation of Women's Clubs and Douglass College of Rutgers, The State University Douglass College. To be eligible for this honor, each nominee must be a woman who has gained visibility in New Jersey for her distinguished service and outstanding accomplishments. Carla Fleming, a resident of Fair Lawn has spent the past 40 years making it a personal mission to reach out to all of our servicemen and women and thank them for their service while protecting the freedoms of our Country. Over $31,000 of her own money was used to travel to Washington DC, Hawaii and Walter Reed Hospital thanking veterans for their service. Cynthia A. Zipf is the Executive Director and founder of Clean Ocean Action and resides in Sandy Hook. Cindy has been a successful coalition builder, forming the Mid-Atlantic Region’s largest most effective voice for the ocean and a leader in forming coalitions with groups throughout the country. Dr. Nicole McGrath of Montclair is the founder of the KinderSmile Foundation. She is a dental professional who gives her time and talent to children who are un-insured, under-insured and unable to get basic oral health care for themselves. Gail Phillips Houlihan of Beach Haven has been an advocate for over 30 years for children placed in the state foster care system, and for encouraging and promoting women and volunteerism. Jean E. Stanfield resides in Westampton NJ and is the first female Sheriff of Burlington County, NJ. Joyce Kovatch Albers-Schonberg of Princeton currently serves as Douglass Capital Campaign co-chair as well as the Board of Overseers of the Rutgers University Foundation. Joyce has served on the AADC Investment Committee for over 25 years and was its chair for five of those years. the First Prize is a 46" flat screen TV. The drawing will be April 3, 2012. 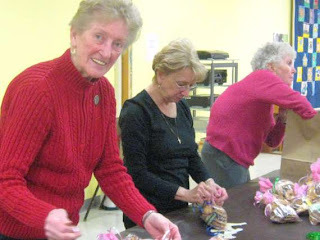 Read about another Woman's Club doing great things! There are truly good and caring people in the world and it was evident at the Feb. 23 bi-monthly meeting of the Vernon Township Women’s Club. The ladies scurried about distributing dozens of varieties of homemade cookies into heart decorated cellophane bags. A yearly campaign, the 102 bags of cookies will be distributed amongst local Sussex County organizations, namely, The Homestead, DASI and Sunrise House. Following the cookie assembly line, the members welcomed guest speaker Rachael Paulson of Hands on the World Global. A former teacher and recent stay-at-home mom, Paulson began the organization back in 2006.